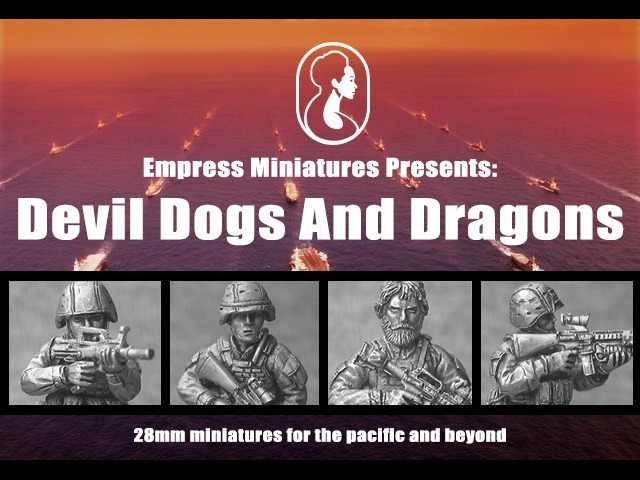 I guess most of you who are interested in modern games in 28mm will already have seen this, but this week Empress Miniatures started their Kickstarter. It is set in the Asia Pacific region. 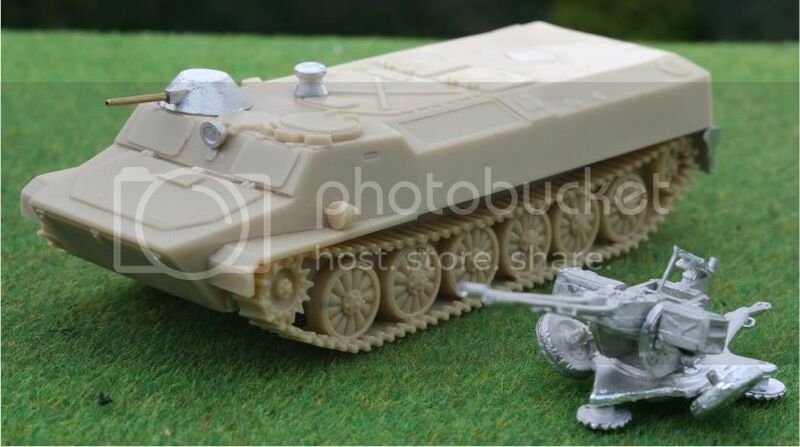 The first forces to come out of it will be USMC (judging by the size of their previous models these should be highly compatible with Eurekas Marines) and Chinese PLA both will feature and initial five 4-mini packs. While things are only at the beginning, they already show, that they have some real cool ideas. They said that there will be SeALs in scuba gear, or PLA boarding parties amongst future stretchgoals. And they already showed that they are listening to the pledgers by offering a Marine with a M32 grenade launcher as a stretchgoal mini or that future stretchgoals shall include Japanese or (most important for my taste) North Koreans! Right now things are going great for them, but i suggest if this is your cup of tea… Go and take a look! For the first time in a very long time we played a modern scenario. Situations was this. As part of a general attack on western Europe, Russia also decided to return the Baltic Republics to the fold. Not willing to let this happen NATO has decided to send an US Marine Expeditionary Corp to retake Estonia, Latvia and Lithuania. While the initial landings went well against the second and third level units used to garrison Russia’s “acquisitions”, the Marines ran into troubles after a few days when The Russians diverted front line reinforcements to the Baltic, together with a strong anti-aircraft screen. 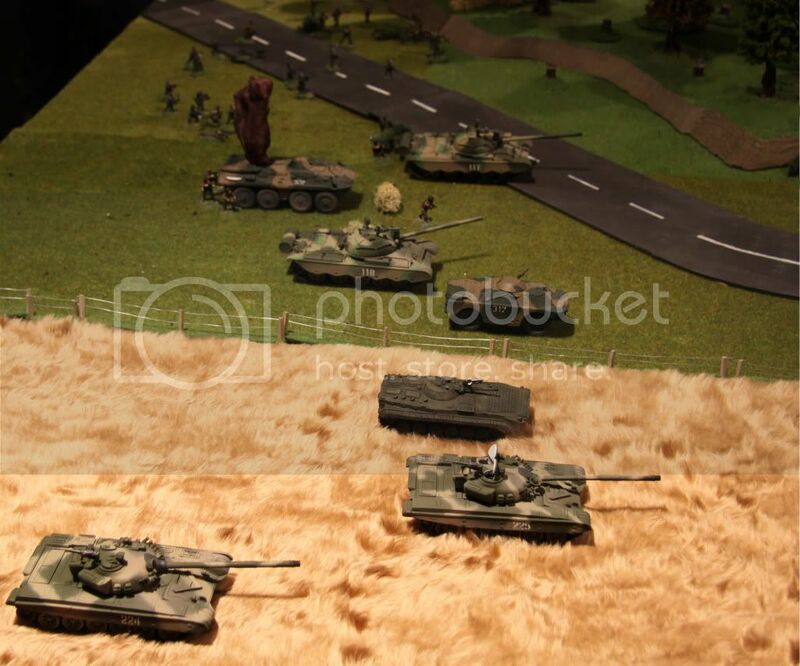 Against this backdrop, a large USMC Recon patrol stumbles over two Russian T-90 tanks besides a small warehouse. Observations show that the tanks actually are the command tanks for a tank battalion operating in the area. Out of range of the ships heavy artillery and not wanting to risk any of the few fighter aircraft still at his disposal, the expeditionary force commander decides to order the Recon team to attack and take the tankers out before they leave for another attack. 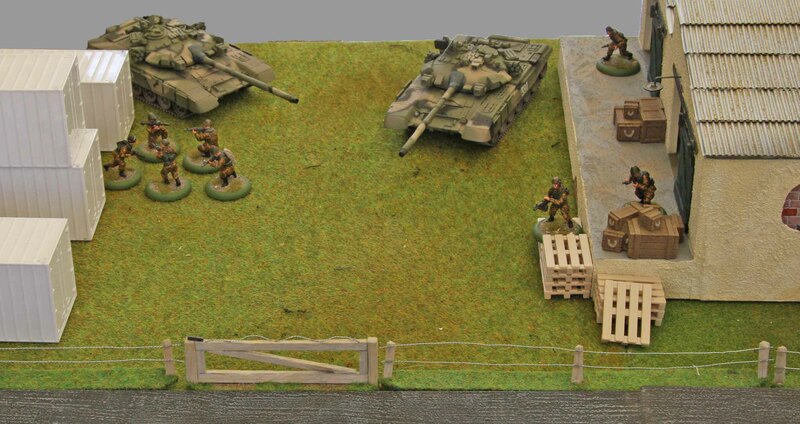 But to make matters worse, there is also a Russian infantry detachment to guard the tanks… not an easy nut to crack! This only being a small skirmish game, we only set up a small table. This was divided at roughly 1/3 of the depth by a raised railroad dam. There was also a road parallel to it. On the other side was a small fenced in warehouse compound with a few containers. The table also featured a small field and some woods. The Russians (eight infantry) set up with-in the compound. Both tank crews were still inside the warehouse where they had spent the night. They would only be allowed to leave it, once the Marines were either spotted or a firefight broke out. The Marines split up into two five men teams that would try to sneak close on each flank. Only the M-60 machine gun would remain behind at the railroad crossing to provide covering fire if need be. At first things went quiet well, with the Marines silently crawling up on their target. But then, having gone roughly half way to their assault position, something went wrong with the team advancing through the woods. Maybe someone broke a branch or it was the glitter of the sun on a weapon optic, but they were made out by the Russians, who instantly opened up with their LMG. Seeing that things were starting to go south, the M-60 gunner instantly opened up on his Russian counterpart and drove him to cover, but it was already too late… two of the right flank Marines had suffered wounds that turned them incapable to fight on. And now a general firefight broke out between the Marines on the right and the Russians who were starting to scramble to take up defensive positions. In this firefight the Corporal leading the Marines there was killed by a sniper bullet, before the SAW opened up and injured the sniper, taking him out of the fight. While trying to crawl out from under the M-60s field of fire, one of the Russian NCO´s raised his head a bit too high and received a bullet to the head. At the same time the Russian LMG fired once more, killing another Marines on the right. Plus now the first Russian tankers were leaving the building as well, making for their tanks. Things were not going well! In this light the Marines on the left gave up their hide. Firing at the Russians closer to the warehouse, they managed to take out the LMG and injure the remaining Russian soldier hiding behind some crates behind by the warehouse. The M-60 ceased its fire and got ready to fire deeper into the compound where the second tank crew had left the building. The remainder of the team split up they. 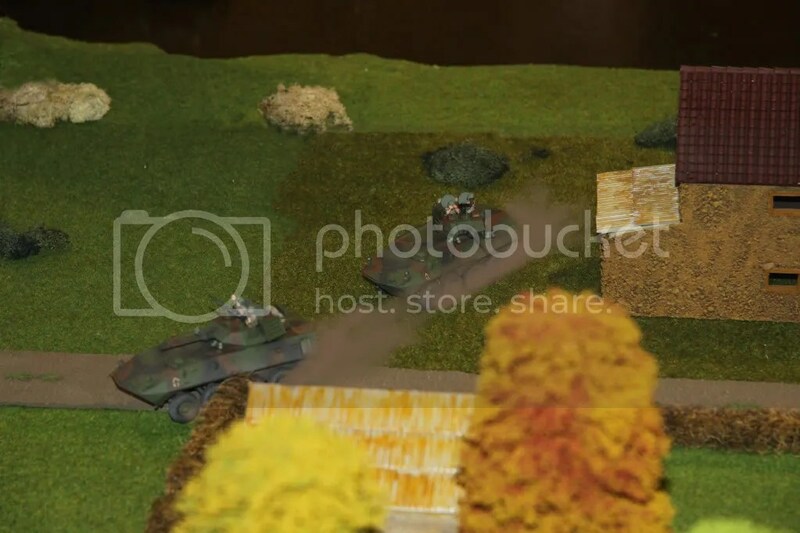 While the recon leader and another of one of his soldiers fired at targets of opportunity, two more soldiers sprinted forward to take the Russians in the flank. Unfortunately, the first of them came under the sights of the Russians Sergeant who just happened to look around one of the containers. One snapshot and another Marines was down with severe injuries, before the Russian NCO got back behind cover of the containers. The other Marine who had just seen his buddy being felled, got down on his knee and fired his grenade launcher between the containers, eliminating the Russian Sergeant. Now the remaining Marine on the left flank (the SAW gunner) shifted its fire to the tankers to its front and together with the Marines from the other flank managed to injure or kill four of them. But only to be killed himself by one of the Russians. 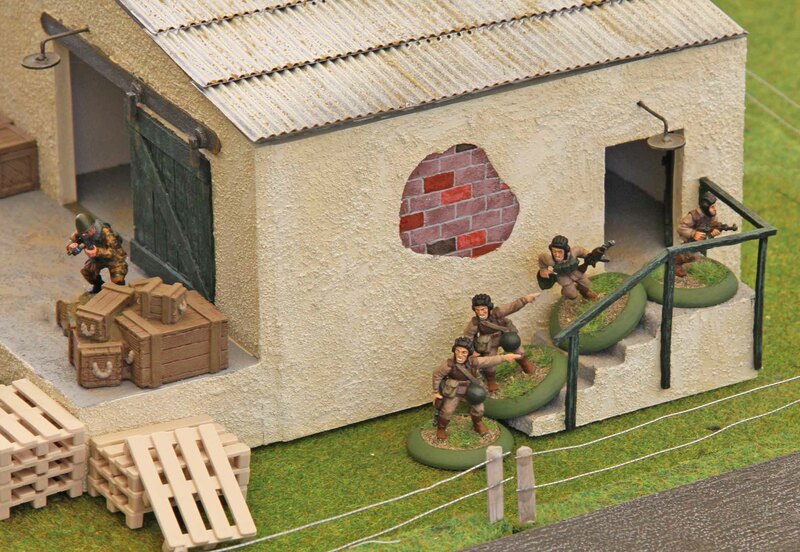 Now the firefight between the Marines and the three remaining Russians between the containers intensified. While one of the Russians was killed by a bullet, the others withdrew deeper between the containers, only popping around the corners for some snapshots. The devildogs tried their best to get them with more grenades, but had no luck. At the same time the M-60 had managed to take out all of three second tank crew except for one, who managed to get into his tank and close the hatches. Seeing that the firefight was getting them nowhere, the remaining three Marines charged. 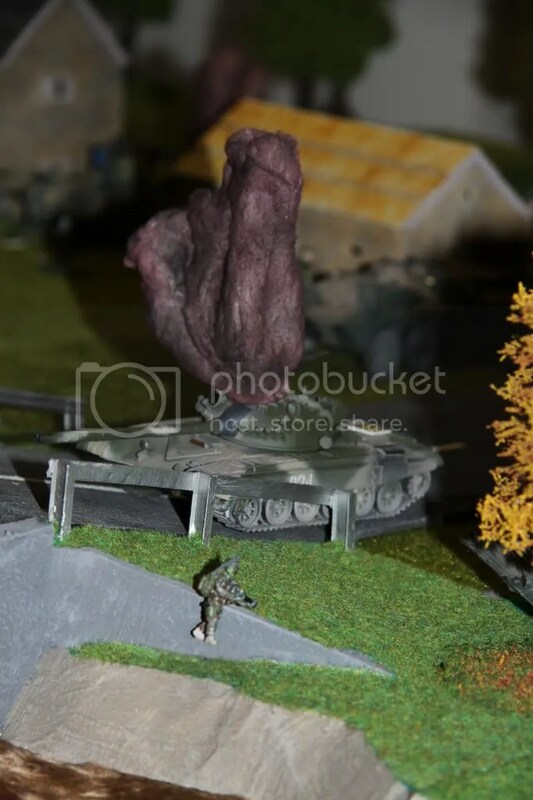 When the team leader ran into the first Russian, they got into a bitter hand to combat, which the Marine ended in his favor. Now the sole remaining Russian infantryman surrendered. At first the tanker refused to do the same but being shown the C4 that was about to be attached to his tank, he chose to surrender as well. After blowing up the T-90s, the Marines left with their two prisoners, dead and wounded… too high a price to pay, but still a victory. OK, the recent posts have led to questions on what colours I used and how I painted both my Marines (woodlands MARPAT) and my Army soldiers (ACU). First off all sorry for the lack of a picture walk through… I kind of shot from the hip here after a couple of requests. Lets start with the technique. 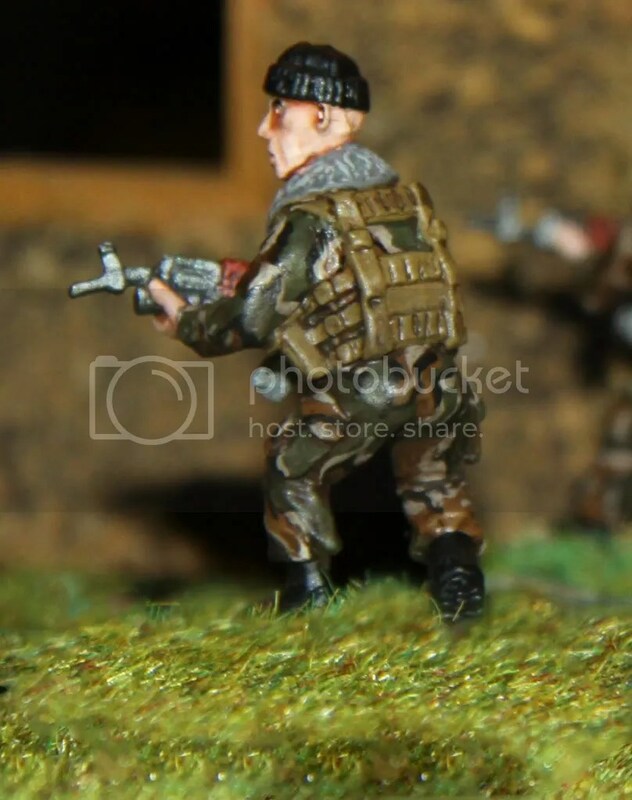 Modern camouflage clothing can be a real problem to paint. 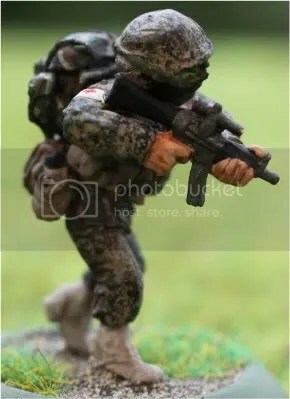 Patterns like the German Flecktarn, USMC´s MARPAT or USArmy ACU look really awesome in real life, but the thought of painting minis in such pattern can really make one give up on the project before it starts. Who really wants to paint tons of little spots or blocks on a mini, much worse a whole set of minis! But there really are easier ways. Since we are only painting scale models we only need to fool the eye and that can usually done with really simple techniques. When it comes to the base colour, you should always start with the dominant colour in the pattern. So for my Marines it was a base of Valejo (VAL) Panzer Aces 339 “Field Grey II highlight”. This is actually a very light brown, much like bleached wood. For the Army I used a base of VAL 886 “Green Grey”. The rest of the work involved what I call “dry dipping”. This basically works like dry brushing. Only that you take a brush with hard hair, approximately “0” or “Fine Detail” size. Use an old one if possible, since it will be ruined afterwards for anything but this technique. You need to prepare it first, which means putting paint on and pushing it straight down on a piece of paper. After a short time the hairs will be bend to the sides and this is when you can use it. Before you start dipping, brush some of the paint off using the same method you used while preparing the brush. When there is only about the amount of paint left you would want for dry brushing, push the brush sideways against the mini. When the paint from the brush is used up, refresh. You do not need to dip it into the paint-can every time, but you can refresh it from the paper you used for getting off the brush. Works about once or twice. Do this for every layer of paint, always going from te most dominant colours to the least dominant ones. In case of woodlands MARPAT this is: VAL 70980 “Black Green”, Black (any manufacturer will do) and Coat d´arms 236 “Horse Tone Grey” (essentially a very light grey or off-white). Since this technique works the same way as dry brushing, the deepest parts will mostly just take on the base colour. Not as much as with dry brushing, since the dipping gets into the recesses to a higher degree, but still not enough. And obviously a camo pattern does not limit itself to the raised spots. So just go back and paint a few small spots of the missing colours with a normal brush into the recesses. Do the same for any spot where you accidentally put too much of one colour. Now go and prepare a wash. In both cases I used 1 part paint (a dark chocolate-brown for the Marines, black for the Army), 5 parts water (if you prepare a larger amount for future use distilled water since it will not rot) and 1 part white or Elmers glue. The later will help the wash settle into th deep spots, creating a shading on the minis that would otherwise be bleeping hard to achieve on a camo pattern like this. Brush the wash on without remorse. Now this technique is fast (you can do about 2 to 3 squads in one evening) and the results look good IMHO. In case you are interested… the boots were done with Coat d´arms 222 “Horse Tone Roan” ( light tan colour), washed with the brown wash and then drybrushed with “Horse Tone Roan” again. Coyote Brown items (the Marines vests) for example were done in “Horse Tone Roan” with a little white mixed in and then washed with th brown wash. 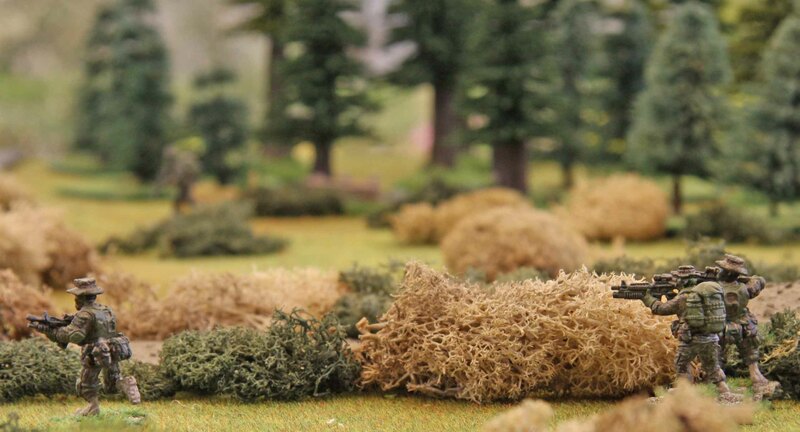 So once done, your Marines and GI´s can start to deploy to any tabletop field of glory. So, on to the next batch. This time it is the infantry squads or fire teams. I assume everyone knows what they do, so I will mostly let the pictures do the talking. The minis are either Devil Dog Designs (DDD) or Black Scorpion (BS, yes I know about the double meaning of tis abbreviation). If a squad has minis from different manufacturers, I will list them left to right. Now the next squad is a bit of an oddity. 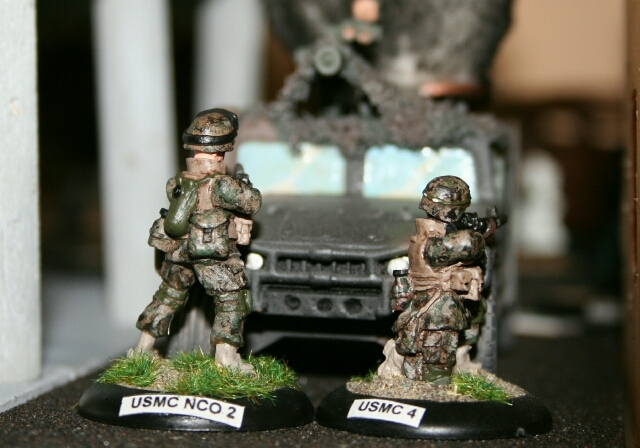 A couple of years ago I painted up the whole DDD range of Marines in woodland BDU´s. Just after I was finished, the Corps changed to MARPAT, which I found much cooler. So I sold my painted minis off and started anew. With the exception of the minis below. These are wearing NBC suits, which were still in a 4 tone woodland scheme, which is why I kept them. Gas masks were sculpted on by me. I recently got a Marine in NBC suit with a Stinger launcher from Eureka. He will act as a replacement for the soldier with the AT-4 in games where I need a little anti-aircraft capability. The squad leader (guy with the cigar) in the next picture won a price in a Black Scorpion painting competition a couple of years ago for the rendition of MARPAT. So this is it. I shall try to take some pictures of my Marine vehicles, to post those, too. But if the weather remains as poor as it is right now, that may take a while. So today it is time for the next installment of Marine minis. I am going to focus on command and force multipliers. First up is the command. 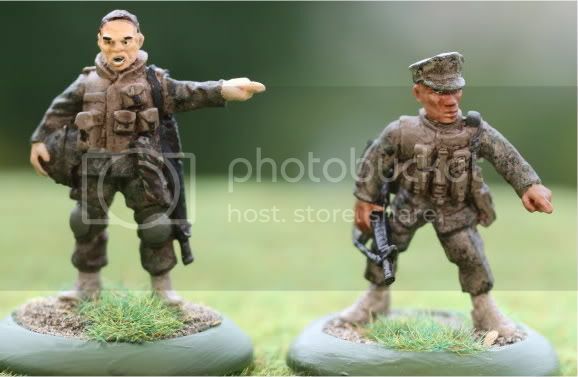 These are just two minis that are meant to represent platoon or company grade officers. I have not made them part of a squad. I am rather going to attach them to one of the infantry squads I am going to show in my next USMC post. Now the mini on the left is from Black Scorpion, the one on the right from Devil Dog Designs. You can see, that I have painted my Marines over a longer period and that my style of painting flesh has changed during that time. I have no big problem with it since these two will probably never be side by side on the table. Obviously one of the biggest force multipliers since the introduction of the rifled musket have been sharpshooters and snipers. So my force can not do without them. The two minis on the flanks are BS, the two in the middle are DDD. Now the later two can double as recon snipers, too. Up next is the infantry part of the Light Armored Reconnaissance (LAR) platoon. The Corps uses the LAV-25 as a light scout tank, with the Marine squads aboard acting as… well… scouts. Now these minis are all DDD. First squad are the minis from the Canadian set (with the squad leader converted to a shotgun). I think I will need to do camo make-up on the second squad, too. One thing that should not be missing is a medic or in this case a Corpsman. Technically he is not a Marine, but a sailor. The USMC does not have medics of its own. That role is filled by troops from the USN. But they dress like the Marines and become part of their structure while on the ground. The mini is a DDD marine converted with a back-pack full of medical supplies, a red-cross armband and an MP-5, since I wanted him to stand out a bit. Last but not least is a FAST or alternatively SRT team. These are not actually a battlefield asset, but I once needed them for a scenario. So what is a FAST or SRT team? FAST stands for Fleet Antiterrorism Security Team. Technically they provide security for high value Naval installations, but mostly on a need be, quick deployment basis. SRT stands for Special Reaction Team. They act like SWAT teams for the USMC´s military police. While both the FAST and SRT have different missions, their equipment can be close, especially when providing security. So i chose to use the same minis for both functions. These minis are from the TAG SWAT range. I converted their base caps to the iconic USMC garrison caps and that was about it. So… this is it for today. Next post will show the infantry squads! Again this has been an awfully quiet month so far. Why? Well I had to work long hours a lot lately and during the summer my painting is geared to be done outside on the balcony. Except that the weather has been bleeping poor lately and I was in no mood to set my stuff up in the kitchen. So essentially I hardly got anything done lately. Well this is not completely true, since my Brandenburg Uhlanen are about half-finished, but they are nothing to show yet. But I decided to take out some of my old minis again to keep you entertained. In this case my modern USMC. Since I have quite a large force there, I am going to split this into 3 posts and I will later follow-up with vehicles and choppers. So first up are my Force Recon Marines and ANGLICO. So what kind of units are these anyway. Now the other unit is a small ANGLICO detachment. ANGLICO [Air Naval Gunfire Liaison Company] is a Marine unit that specializes in coordinating artillery (both ground based as well as naval gunfire) and close air support [CAS] for the USMC, Navy, Army and foreign allies. Whilst a separate unit, they are an asset available to the MAGTF commander. Now that is it for today. I will try to post the next installment ASAP. Those will be command as well as other platoon or above assets. As I said yesterday… we did a slight variation of a the Crisis game a few weeks later. We had to make some changes. While my table is quite large (2m x 3,5m at maximum expansion) it was not quite large enough to fit the whole Crisis table. So we traded the river for a railroad cut. The Russians were allowed to deploy far closer to the Recon/ANGLICO detachment. 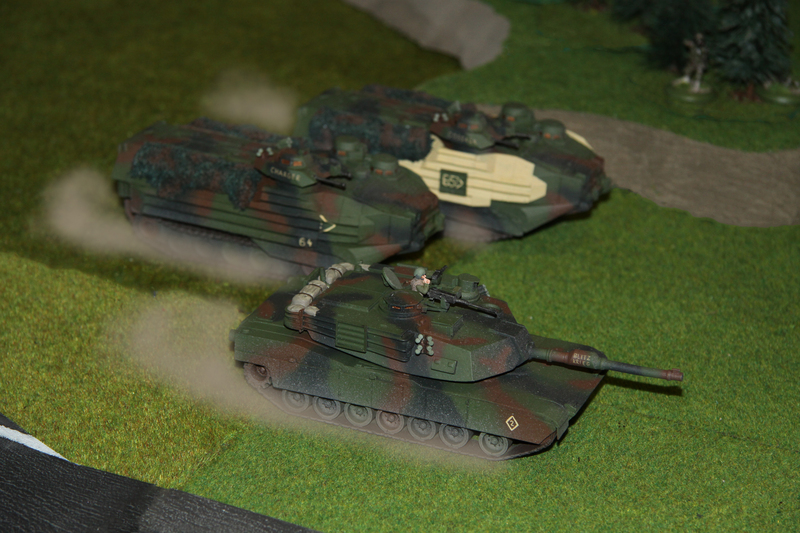 The Marine reinforcements had a longer way to go, but were allowed to deploy with their Abrams tanks on table. 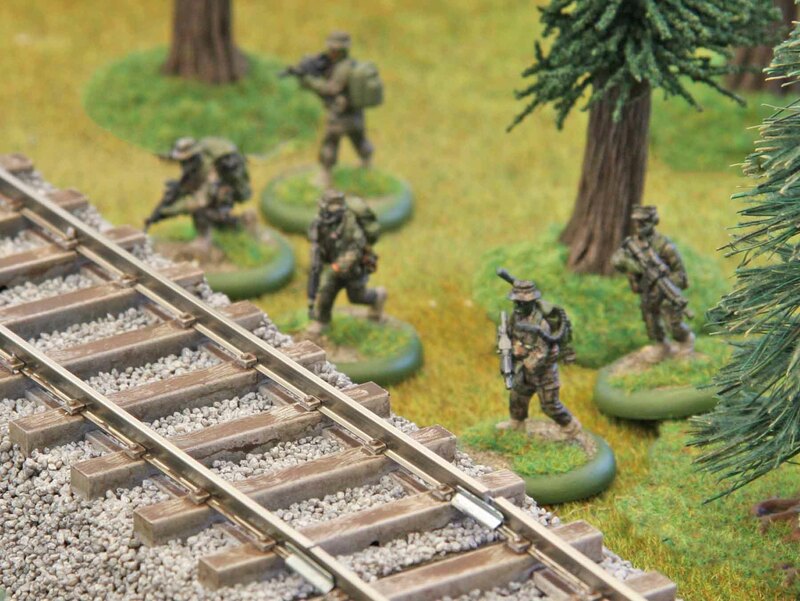 I deployed the Recon/ANGLICO Marines inside the railroad cut where they had good cover. My tanks started at full speed to reach them as fast as possible. 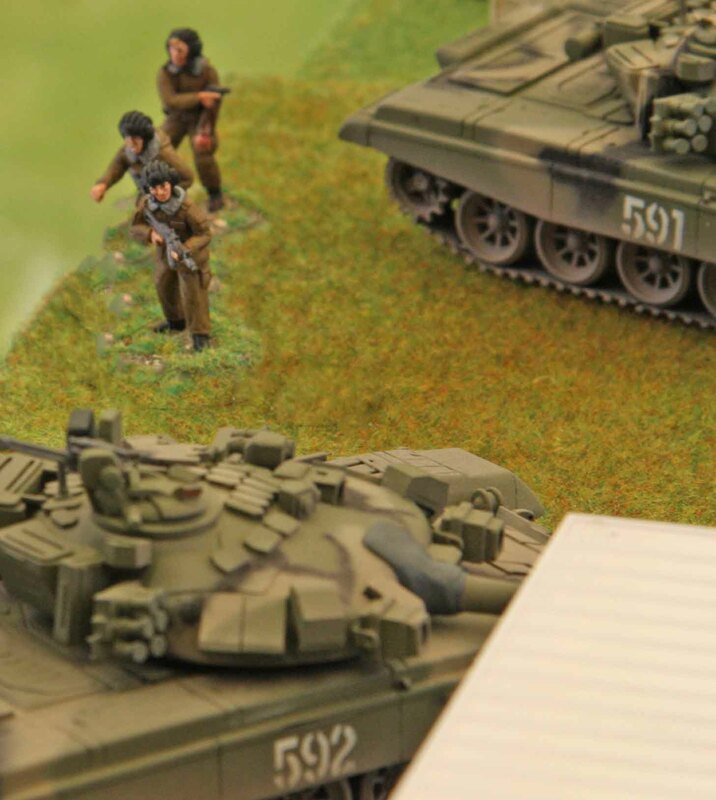 The Russians made a slow and meticulous advance, keeping the T-62´s behind providing covering fire for the rest of the troops, while they advanced. Now this time the Recon/ANGLICO troops proved their worth. As elite troops they picked their targets carefully. Virtually every sniper, NCO or light machine gunner that came into sight, fell prey to their fire. All the while they were quite safe. Their position gave them good cover and their losses where extremely light. 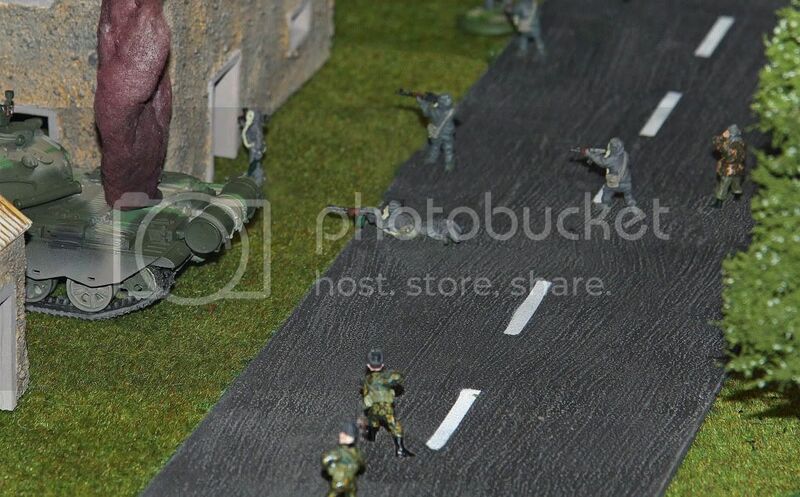 In the end this frustrated the Russians so much, that they charged their BRDM ahead trying to run them over. Fortunately most of them were able to jump out of the way. Before the BRDM could turn around for another run, one of the Marines fired an AP-grenade at the rear of the vehicle, hitting its engine and setting it on fire.The resulting disorder inside the railroad cut did not help, the Russians too much, since the LAV´s had reached the bridge to give their comrades the necessary support. All the while the Russian tanks were paying a heavy price, too. The T-62´s were easy targets for the Abrams tanks. With their modern targeting systems the stationary T-62´s were sitting ducks and their weak armour provided no protection against their 120mm rounds. At the same time the TOW Hummer took care of the T-72 trying to block to bridge over the railroad cut. By this time the Amtracs had reached the railroad cut as well and started discharging their troops. The Russians saw hat their time had run out and began to withdraw, which eventually ended the game. American losses were minimal, so eventually this was a clear Marine victory. I know it has been quite a hiatus lately, but life has been somewhat hectic. 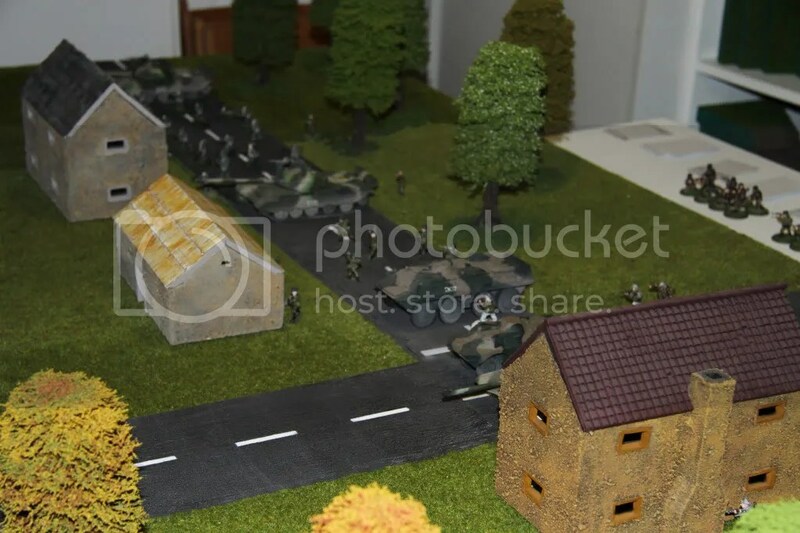 Nothing new to present from the painting front (painted less then one hour over the last two weeks) so I thought I should show you some pictures from the game we presented at Crisis in Antwerp last year. We presented something from a period we like to play from time to time… hypothetical WWIII. Now I think this needs a few words to give you a perspective. I like (ultra) modern warfare, but I feel that wargaming things like Somalia, the Balkans, Chechnya, Iraq or Afghanistan is simply too close to home. So I felt that pitting Russia against NATO is a good alternative. The setting is somewhere in the earlier half to middle of this decade, with a Russia that is starting to prosper due to the rising prices of oil and gas and that has been able to rebuild its military. NATO has expanded to the east, taking former Warsaw Pact members up. But NATO is also committed on its missions in Iraq and Afghanistan. Nuclear arsenals have been reduced and neither side can hope take out the others arsenal with a nuclear strike. In this situation someone sets up Russia and NATO against one another. Yes I know… Tom Clancy has had the same idea, but one can always borrow a good idea! So Russia decides to avenge itself and launches an attack at Central Europe, where forces are stretched thin due to the War on Terror. Poland and the Baltic Republics are the first to fall. The only NATO nation that would be able to send forces to help Poland would be Germany, but the right-wing government on Warsaw fears a repeat of 1939 and refuses help. After having dealt with the Poles, the Russian forces push the German vanguard back to River Elbe, where they are stopped with the help of British, French and US Army forces. The Baltic Republics had to fall, since Russia could not ignore a threat in its flank. Being isolated they did not have the forces necessary to put up resistance for long and were invaded. With the Russian troops being stalled and in places being pushed back inside Germany, NATO decides to open a second front and sends II Marine Expeditionary Force to liberate the Baltic Republics. And this is when this scenario takes place. A Force Recon unit together with an ANGLICO squad had infiltrated during the night to secure a bridge over a river until relief arrives from the beachhead. Shortly before this happens, they come under massive attack by a Russian force consisting of tanks and lots of infantry. Now the Russian force 2nd or 3rd tier force dedicated to garrison duties. 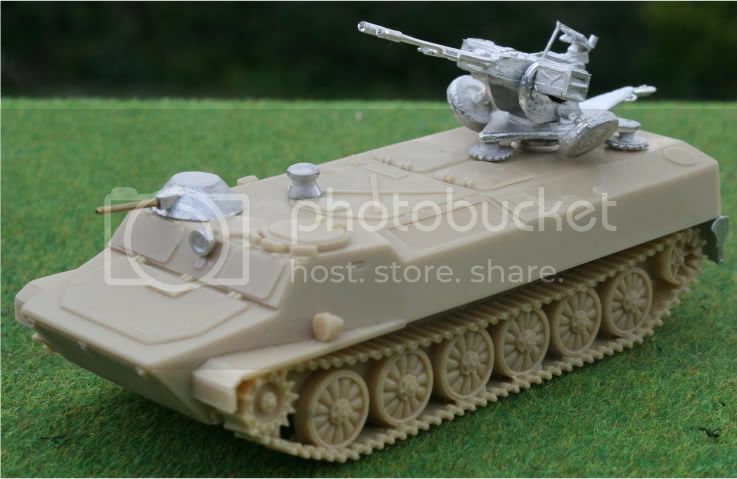 There is a high number of recruits amongst their infantry, they lack APC´s or IFV´s (the best they have is a BMP-1 and a BTR-80 and their tanks are outdated (T-62´s and T-72´s without major technological updates). The Marine relief units consist of two scout LAV-25´s, two Amtracs and two Hummers (one with a .50cal, the other with a TOW). There are two Abrams that will arrive later, since these have been held up clearing some resistance along the route. 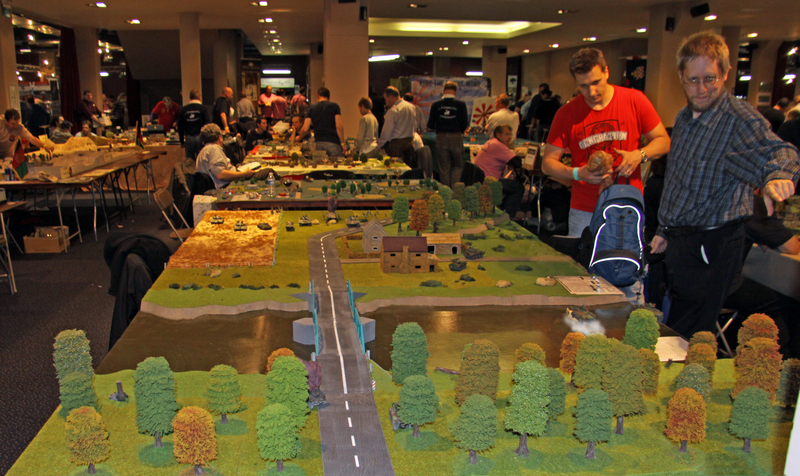 Now as you can see from the picture, we played this on a massive 4,5m x 2m table, with the river alone being almost 1 meter wide. Victory conditions were quite bloody. One point for every soldier killed or incapacitated or vehicles put out of action. The Recon and ANGLICO soldiers were worth 3 points though. 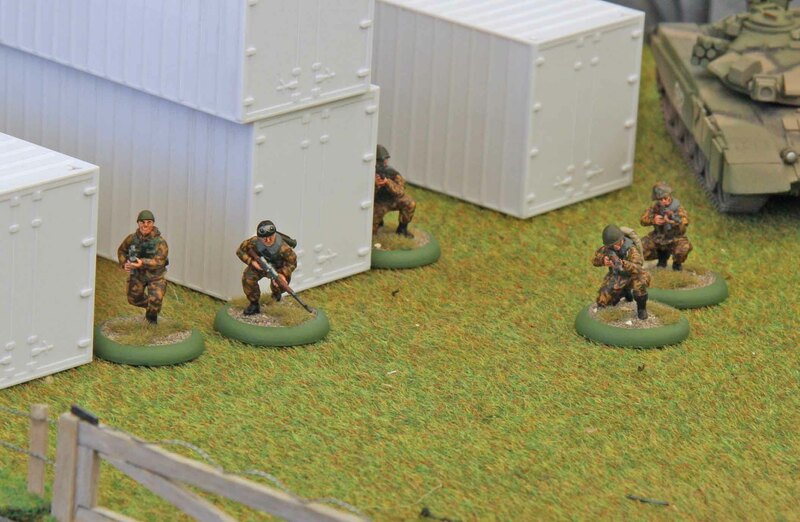 Even though players knew this and even though they were allowed to deploy them inside the buildings or on the rear of the river bank, the Recon/ANGLICO detachment was mostly deployed in the open, which meant they took a heavy toll from the very beginning. The Russians tried to keep their force on the move to reach the river as fast as possible. They soon found out, that their T-62´s were no good at shooting on the move, so most of the firing was done by the T-72´s. 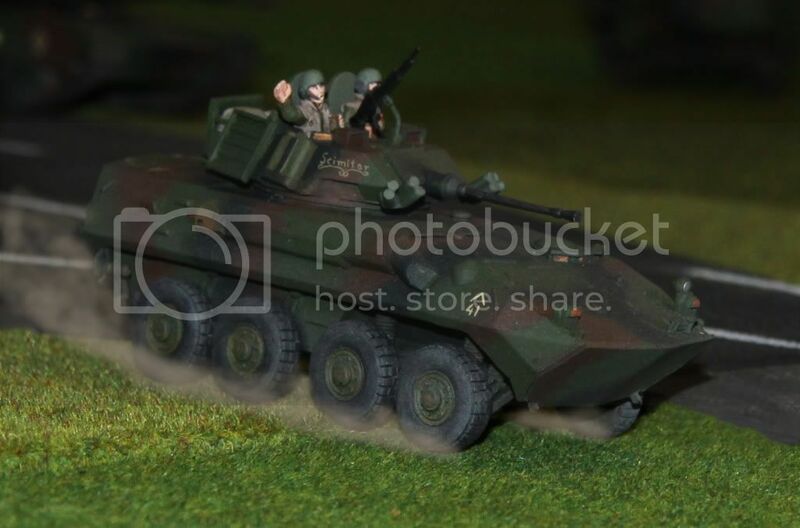 In the meantime the LAV´s sped across the bridge to give support to the troops on the other side, destroying the BTR-80 on the move. Unfortunately there was not that much they could do. Due to their poor position, most of the Recon/ANGLICO detachment had already been wiped out by the time the LAV´s rolled into the village. All the while the Hummers had taken up position behind the bridge and the TOW armed of the two was exchanging shots with the T-72´s. It took out one of them, before it was destroyed itself. Meanwhile the Russian infantry suffered a lot from the Amtracs. These had entered the river on the left flank and were swimming over to the other side firing their .50cal / MK19 combinations on the move. A lot of the Russian infantry was crossing the ridge of the small hill at this time and were subjected to this fire. After some skirmishing we got lost in talking to the players and eventually called the game a draw. While the Russians had lost more men and vehicles, the Marines had lost just too many men from their Recon/ANGLICO unit. We played a variation of this game a few weeks later and I will try to get some shots up tomorrow. … but this is what I did. As those of you who have followed my previous posts might have noticed… I have been painting an awful lot of Napoleonic minis this year. A total of 13 riders, 8 horses (mind you, most of the horses for the 12th Cuirassiers were painted last year), 139 infantry- and artillerymen and 4 artillery pieces. Not bad for a little over 5 month. Anyway… I needed a break last weekend. So I finished the bases of my 3/13th Silesian Landwehr (pictures to follow soon) and turned to some modern stuff. Moderns will be my extra project for this year. I usually try to finish something small every year, to make some progress outside my main projects. So some time in January this year, I could not decided which one to go for… either finish my modern project or my WWII British Paras. So I asked my better half and she said “Moderns”. So I finally sat down and assembled resin models and converted some of them to my gusto. Please beware, that all photos in this post are WIP. Which means I still need to add greenstuff to fill gaps from my conversions and that stowage will be added after the first painting phase! I began with a Russian MTLB from HLBS. Now I had seen a number of photos from Chechnya and South Ossetia, where the Russians welded a ZSU-23 A³ gun to the top of an MTLB. I wanted that kind of extra firepower for mine, too. Since I also had a Sloppy Jaloppy ZSU lying around this seemed like the perfect match. On the other hand I want to use the APC without the gun and I have at least one scenario in mind where I need a seperate gun. So what´s the solution… buy everything twice? In the end I came up with a simple and cheap solution. I have started to attach the turrets of my resin tanks to the hulls using neodym magnets. The ones I use are only 1mm thick and 1cm in diameter. So I drilled a hole into the rear hull of the MTLB, put one magnet into it flush with the hull and put another one underneath the gun. I had to add some plasticard to the underside of the gun, to bring the magnets closer together without touching each other (I do not want any paint to scratch off on top the hull magnet). When I get to the greenstuff phase, the edge between the hull and magnet will be filled and you will not see the magnet anymore when painted. 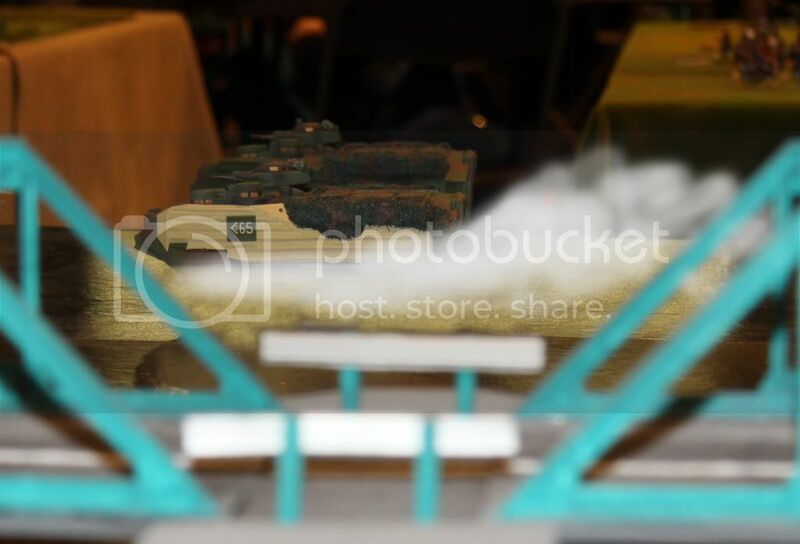 Next up were two BMP-1´s and two BMP-2´s from HLBS and three Striker IFV´s and one Striker MGS from Imprint. Those were build straight out of the box and I will not bore you with pictures of them right now. But the interesting part came next… 5 Hummers. One of them (the one cast in light grey resin on the photo) will go to my Marines. Now as with the other Hummers I already build for my Marines, they are meant to be simple models. So all I did was raise the air-intake snorkel, add a sidepipe exhaust, a cowbar cannibalized from a Maisto toy and a gunshield for the MK19 autogrenadelauncher. The other 4 (white resin from a batch I bought a couple of years ago) will go to my US Army troops. I am playing a hypothetical WWIII set in Europe around 2003 to 2004. These are meant to represent vehicles from units stationed in Germany suddenly called to the front. In that sense they are supposed to look field modified, just like the ones we saw early on in Iraq or Afghanistan. 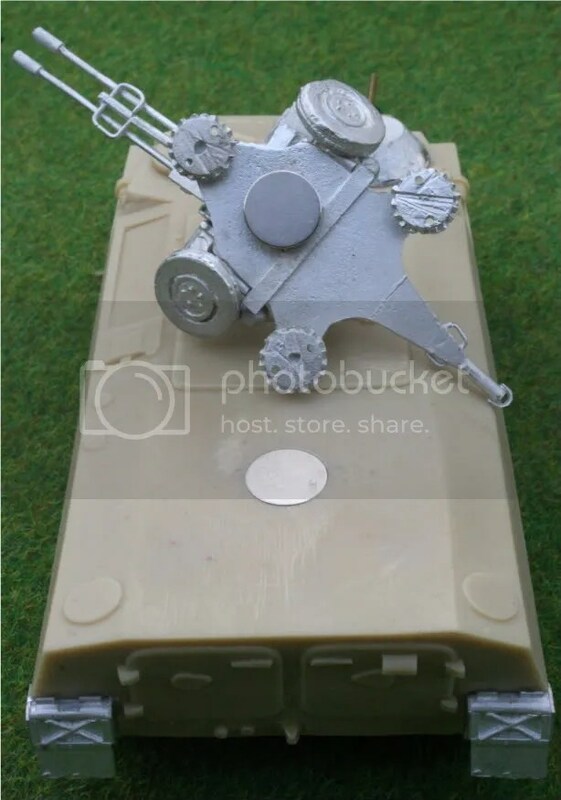 So in addition to the normal gunshields, I added field improvised armour to the gunner positions of the .50cal and MK19 Hummers and armour shielding to the doors.One also got a cowbar, another one a push-bumber and an antennae array (this will most likely become the command vehicle). But I have to say… I am still not satisfied with their looks. I started on cutting some armour plating for the lower hull, but cutting one piece out was no fun and I can not imagine doing so for 4 vehicles. So at best I will do the one of them that way. I have some smoke dischargers lying around so one or two of them will get those. Most likely another push-bumper and maybe a towing assembly. Lets see how these turn out in the end. If you have any suggestions… they are more than welcome!